You are here: Home / Life & Lollypops / Athens 2011 and the Greek Revolution. Don’t believe the media. Athens 2011 and the Greek Revolution. Don’t believe the media. The media is lying about events in Greece. Read these & support the people. This is not so much a blog post than a collection of tweets from a good friend who resides in Athens. I’m posting it because people need to know about it. The more people who know about it, the better! So please share, email, re-blog, re-link, whatever. These are posted in reverse chronological order because that is the way Twitter’s timeline works: the oldest are at the bottom, so start there and read upwards. It’s quite long; please stick with it to the end. I suggest that if you want to stay informed, follow people who actually live in Athens. The timeline is updated every few minutes. This is merely a snapshot. 3 cops Vs 1 elder protester from today’s protests in #Athens – tro-ma-ktiko.blogspot.com/2011/06/blog-p… – Welcome to Greece, enjoy your stay. Riot police in #Athens did not hesitate to brutally assault mothers with their children today. Long live democracy. Long live human rights. The police has brutally beaten hundreds of peaceful protesters and bystanders today in #Athens – I bet you don’t hear that on your news! The vote in Athens is a Greek Tragedy, keeping the country imprisoned inside an unsuitable currency union and with unservicable debts. Police at #Syntagma Sq brutally beating protesters indiscreetly while new austerity measures have been voted by Greek parliament. @guardiannews They’re NOT austerity protesters. They’re undercover cops and it’s been a proven fact. TELL THE BLOODY TRUTH! Extensive & INHUMAN use of chemicals & teargas has been made by the police at #Syntagma Sq in #Athens, #Greece. RIOT POLICE IS ATTACKING PEACEFUL PROTESTERS IN #ATHENS, AT #SYNTAGMA SQ NOW! @cnnbrk Stop lying! Riot police is clashing mainly with undercover police dressed up as anarchists! STOP LYING! Plain ppl are PEACEFUL! I’ve been observing the tweets sent out by major network news anchors & correspondents. They make me sick. They’re all lying. All of them. Peaceful protesters have formed a human chain, hand in hand & are making the riot police retreat from the main square! Do not believe the mainstream media. 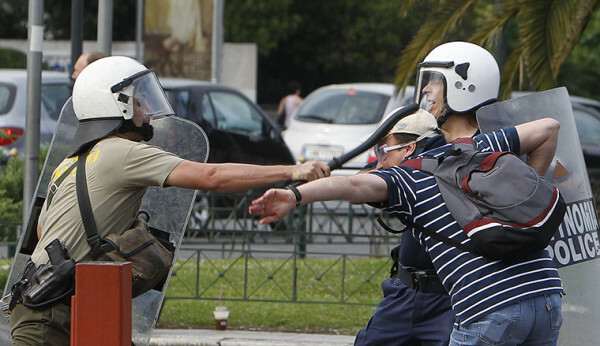 Plain Greek protesters are NOT clashing with the police. It is a fake setup! Do not trust the media! If there’s a Hell, you know there’s an entire hotel there reserved just for major network news anchors. Big, fat, greasy liars. Provocateurs in Athens spark massive clashes with the police at Syntagma square.